And when they arrive before the Cross* the daylight is already growing bright. There the passage from the Gospel is read where the Lord is brought before Pilate, with everything that is written concerning that which Pilate spake to the Lord or to the Jews; the whole is read. And afterwards the bishop addresses the people, comforting them for that they have toiled all night and are about to toil during that same day, bidding them not be weary, but to have hope in God, Who will for that toil give them a greater reward. And encouraging them as he is able, he addresses them thus: "Go now, each one of you, to your houses, and sit down awhile, and all of you be ready here just before the second hour of the day, that from that hour to the sixth you may be able to behold the holy wood of the Cross, each one of us believing that it will be profitable to his salvation; then from the sixth hour we must all assemble again in this place, that is, before the Cross, that we may apply ourselves to readings and to prayers until night." After this, when the dismissal at the Cross has been made, that is, before the sun rises, they all go at once with fervor to Sion, to pray at the column at which the Lord was scourged. And returning thence they sit for awhile in their houses, and presently all are ready. Then a chair is placed for the bishop in Golgotha behind the Cross, which is now standing; the bishop duly takes his seat in the chair, and a table covered with a linen cloth is placed before him; the deacons stand round the table, and a silver-gilt casket is brought in which is the holy wood of the Cross. The casket is opened and (the wood) is taken out, and both the wood of the Cross and the Title** are placed upon the table. And as all the people pass by one by one, all bowing themselves, they touch the Cross and the Title, first with their foreheads and then with their eyes; then they kiss the Cross and pass through, but none lays his hand upon it to touch it. When they have kissed the Cross and have passed through, a deacon stands holding the ring of Solomon and the horn from which the kings were anointed; they kiss the horn also and gaze at the ring, all the people are passing through up to the sixth hour, entering by one door and going out by another; for this is done in the same place where, on the preceding day, that is, on the fifth weekday, the oblation was offered. And when the sixth hour has come, they go before the Cross, whether it be in rain or in heat, the place being open to the air, as it were, a court of great size and of some beauty between the Cross and the Anastasis;*** here all the people assemble in such great numbers that there is no thoroughfare. The chair is placed for the bishop before the Cross, and from the sixth to the ninth hour nothing else is done, but the reading of lessons, which are read thus: first from the psalms wherever the Passion is spoken of, then from the Apostle, either from the epistles of the Apostles or from their Acts, wherever they have spoken of the Lord's Passion; then the passages from the Gospels, where He suffered, are read. Then the readings from the prophets where they foretold that the Lord should suffer, then from the Gospels where He mentions His Passion. Thus from the sixth to the ninth hours the lessons are so read and the hymns said, that it may be shown to all the people that whatsoever the prophets foretold of the Lord's Passion is proved from the Gospels and from the writings of the Apostles to have been fulfilled. And so through all those three hours the people are taught that nothing was done which had not been foretold, and that nothing was foretold which was not wholly fulfilled. Prayers also suitable to the day are interspersed throughout. The emotion shown and the mourning by all the people at every lesson and prayer is wonderful; for there is none, either great or small, who, on that day during those three hours, does not lament more than can be conceived, that the Lord had suffered those things for us. Afterwards, at the beginning of the ninth hour, there is read that passage from the Gospel according to John where He gave up the spirit. This read, prayer and the dismissal follow. And when the dismissal before the Cross has been made, all things are done in the greater church, at the Martyrium,**** which are customary during this week from the ninth hour -- when the assembly takes place in the Martyrium -- until late. And after the dismissal at the Martyrium, they go to the Anastasis, where, when they arrive, the passage from the Gospel is read where Joseph begged the Body of the Lord from Pilate and laid it in a new sepulchre. And this reading ended, a prayer is said, the catechumens are blessed, and the dismissal is made. But on that day no announcement is made of a vigil at the Anastasis, because it is known that the people are tired; nevertheless, it is the custom to watch there. So all of the people who are willing, or rather, who are able, keep watch, and they who are unable do not watch there until the morning. Those of the clergy, however, who are strong or young keep vigil there, and hymns and antiphons are said throughout the whole night until morning; a very great crowd also keep night-long watch, some from the late hour and some from midnight, as they are able. 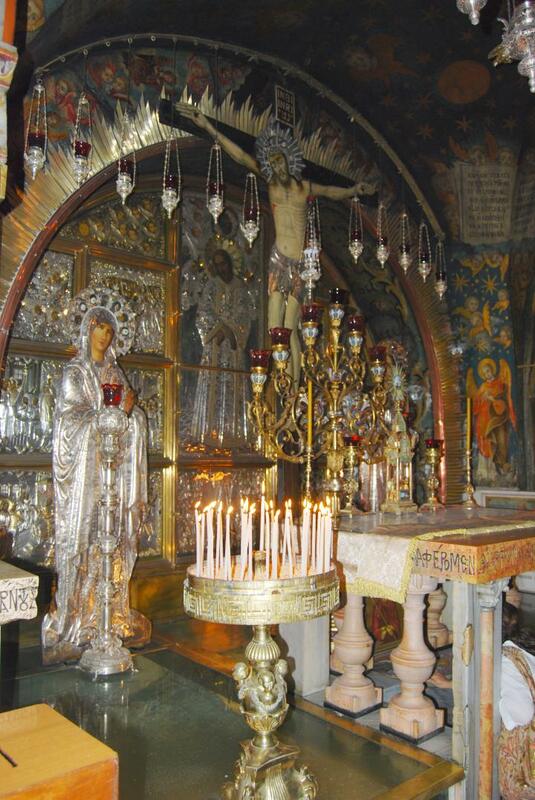 * The location where Christ was crucified, on Golgotha, located in the Church of the Holy Sepulchre. ** The Title is the sign affixed to the Cross of Christ by Pilate which stated in Hebrew, Latin and Greek: "Jesus the Nazarene, King of the Judeans." *** The Anastasis is the Rotunda or Holy Sepulchre itself. **** The Martyrium is the main church inside the Church of the Holy Sepulchre.